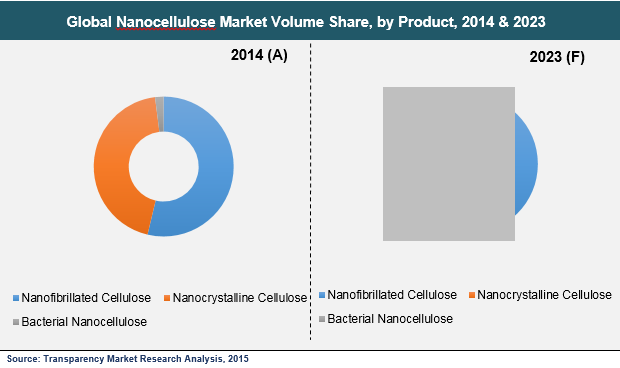 The global nanocellulose market features an intensely competitive vendor landscape. This is on account of the potential demand for nanocellulose for a vast range of applications in various end-use industries. A growing number of manufacturers world over are capitalizing on demand coming from numerous industries, particularly in the oil and gas industries. Other industries from which profuse opportunities are emanating are paints and coatings, paper processing, personal care products, and food and beverages. Top players operating in the market are CelluForce Inc., UPM-Kymmene Oyj, Nippon Paper Industries Co., Ltd., American Process Inc., and Daicel FineChem Ltd., finds Transparency Market Research. The global nanocellulose market was valued at US$54.19 million in 2014 and is forecast to reach a worth of US$699.6 million by the end of 2023. To reach this valuations, the global market is projected to expand at an exceptionally impressive CAGR of 33.8% from 2015 to 2023. The broad product categories of nanocellulose are nanofibrillated cellulose, nanocrystalline cellulose, and bacterial nanocellulose. Of these, nanofibrillated cellulose leads the pack as it held over half of the overall market shares in 2014. The proliferating demand for this in end-use industries accounts for its prominence throughout the assessment timeline. On the regional front, Europe and North America emerged to the fore and contributed a combined share of over 60% in 2014. These regional markets are likely to retain their lead in the coming years as well. This is attributed to the extensive uptake of nanocellulose in the industries such as personal care, food and beverages, and paper processing. The nanocellulose market is driven by a panoply of applications in large spectrum of areas related to material sciences and biomedical engineering. The potential rising demand for the material in the industries such as paper processing, paints and coatings, food and beverages, and composites is on the account of several interesting properties it possesses, including a host of optical and mechanical properties. The burgeoning interest from the end users particularly stems from its properties such as being light weight, naturally anisotropic, good biocompatibility, and favorable surface chemistry. The substantial demand for nanocellulose as fracturing fluid is potentially boosting the market. The rising demand for nanocellulose in the food and beverages packaging over the past few years is propelled by the need for biodegradable, eco-friendly packaging material. The large strides being witnessed in the area of sustainable packaging has been fueling the demand in recent years. In the packaging industry, their usage is supplanting that of polystyrene-based foams. The market is also benefitting from the rising application of nanocellulose in the paper and pulp industries world over. The market is also witnessing several exciting avenues from its prospects in promoting environmental footprints in end-use industries. This is on account of the fact that nanocellulose replace petrochemical-based materials in great many applications. This has led governments of several countries in promoting the production of nanocellulose materials. However, the lack of awareness of nanocellulose, particularly in still-developing regions, and large investments needed to scale up its production are notable factors hindering it commercialization, thus impeding the market. Nevertheless, the vast prospect of nanocellulose applications in making medical implants, electronics, and pharmaceutical formulations is creating vast lucrative opportunities for market players. Moreover, nanocellulose materials have proved to be more cost-effective than most other high-performance nanoscale materials. Rising research and development activities to leverage the eco-friendliness properties of nanocellulose in current and new applications are expected to pave way for attractive prospects over the assessment period. The study presented here is based on a report by Transparency Market Research (TMR) titled “Nanocellulose Market (Product - Nanofibrillated Cellulose, Nanocrystalline Cellulose, and Bacterial Nanocellulose; End User–Composites, Paper processing, Food & Beverages, Paints & Coatings, Oil & Gas, Personal Care, Biomedical, Electronics, and Pharmaceutical) - Global Industry Analysis, Size, Share, Growth, Trends and Forecast, 2015–2023”.